Military AutoSource is now taking orders on the 2019 Mercedes-Benz AMG Lineup! You have never experienced luxury until you’ve gotten behind the wheel of a Mercedes-Benz AMG. 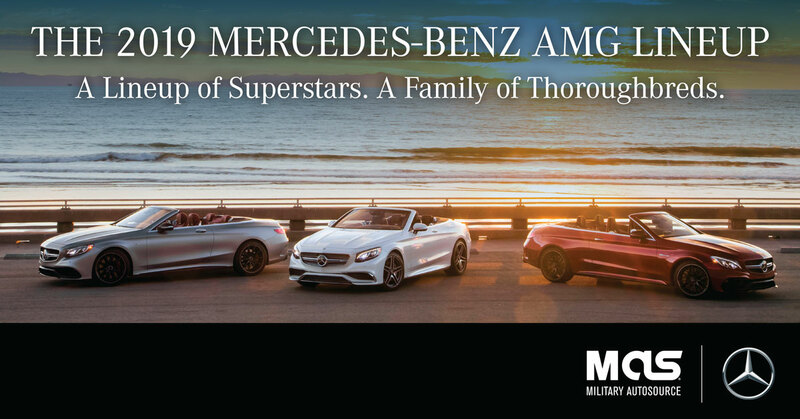 The style and the performance of the AMG models are unparalleled. With an upgrade in technology these performance vehicles with AMG pedigree and a thirst for speed are fitted with numerous AMG enhancements, every vehicle screams “Drive me,” because in the AMG family, performance is king. From coupes and sedans to SUVs and roadsters, the power and handling of the AMG lineup beckon to the world’s most passionate drivers. All that’s left to do is grip the wheel and press the accelerator. Request your free quote today. Military AutoSource (MAS) is the only on and off base, factory-authorized distributor for 17 brands of cars, trucks, SUVs, and motorcycles to U.S. military personnel stationed overseas, or on TDY assignment for at least 30 days outside of the United States. Onbase, MAS is the official partner of the Exchange and NEXCOM, and together we have provided our deployed military and DOD eligible customers with superior value, service and convenience for over 60 years. At MAS we personalize a car shopping experience for every military member based on his or her individual needs, duty location, and financing requirements. For financing, we partner with USAA, Navy Federal, and every on-base credit union to offer you the best rates and terms. Come and visit our overseas locations, or shop conveniently online. We offer the most upfront, hassle-free, secure, and trustworthy car buying program available. We’ve got your back!